We are happy to announce the establishment of the Institute for Medieval Japanese Studies Foundation, officially recognized in July 1999 as a 501 (c) (3) Not-for-Profit Corporation in the State of New York. This new financial structure has greatly facilitated the fund-raising for IMJS projects and also reduces our costs. Donors may become patrons of the Institute in general or may designate specific projects they want to support. All gifts to the Foundation are tax-exempt by the United States Internal Revenue Service. After two and a half years of outstanding service, Executive Director Tammy Allen left the Institute at the end of December, to pursue a graduate degree in Columbia’s School for International and Public Affairs. We wish Tammy the warmest congratulations and the best of luck. In January, the Institute welcomed Miho Walsh from the Consulate General of Japan in New York as the new Executive Director, and with her dynamic leadership and organizational skills, she has already made her own mark on all our programs. Elizabeth O’Brien also joined the Institute in January as our first full-time Publications Manager, whose many publishing responsibilities include production of this newsletter. Ken Aoki remains central to our staff, in charge of all Japanese language document management. As always, the Institute’s programs would not be possible without the hard work of our talented part-time associates. Many thanks to Tomoko Sumida, Tomoko Sugahara, Herschel Miller, Gina Cogan, Celina Lee, Chin Yoo, our Tokyo liaison Ota Terumi, and our music intern, Miyuki Ito. We also welcome warmly the new Executive Director of our Kyoto Branch, Oishi Kuniko. We are happy to announce the addition of Professor Okuda Isao of University of the Sacred Heart to our Imperial Buddhist Convent Survey Team and especially to the Restoration Project. Professor Okuda has had many decades of experience in monastery archival research and brings great strength to our convent project. We also welcome to the team Tanaka Masaru of Hanazono University, who is assisting in the computerization of cataloging at Hôkyôji convent and playing a vital role in the planning for the new Kyoto center. With the generous support of the eminent Tendai nun and celebrated novelist Setouchi Jakucho, the Institute for Medieval Japanese Studies opened a small branch office this past January in Arashiyama, Kyoto. The office was established to facilitate IMJS’s liaison work with the Abbesses of the Imperial Buddhist Convents of Kyoto and Nara, as well as with the scholars and foundations in Japan involved in the convent survey and preservation work of the Institute. Ms. Oishi Kuniko has been appointed our new Executive Director in that office. In March, Setouchi Jakucho and Barbara Ruch announced the establishment of a Center for the Study of Women, Buddhism, and Culture to become a multi-purpose center in Sagano, Kyoto, where the history of Kyoto convents first began. The center will serve as 1) a liaison office for the survey projects in Imperial Convent archives 2) a liaison office for the Restoration of Convent Treasures Projects being funded by the World Heritage Foundation, headed by the eminent artist Hirayama Ikuo 3) an archive to preserve microfilm and research materials on convent culture 4) a meeting place for Buddhist nuns from Southeast Asia, Taiwan, the People’s Republic of China, Korea, and Japan 5) a resource center for graduate students from Europe, Asia and the Americas who are studying aspects of women and Buddhism and 6) a site for public lectures, exhibitions and programs related to the culture of convents. Sen Sôshitsu, the iemoto of Urasenke and Professors Akai Tatsurô, Manabe Shunshô, Ueda Masaaki, and Donald Keene have been invited to sit on the Board (Rijikai.) The Center is currently seeking legal status in Kyoto city and will be hiring a full-time Director in Kyoto as soon as fund-raising is completed. Also advising the Center are President Kurokawa Mitsuhiro of Toraya, Inc.; President Hata Masataka of Shoyeido, Inc. In the United States, Professors Ryuichi Abe, Martin Colcutt and Jacqueline Stone have been invited to be advisors. We warmly welcome all interested to help us make this Center a successful resource for scholars, students, the Buddhist clergy, and the Japanese public. Temporarily, the IMJS Kyoto Branch office is serving as the planning office for the Center. A formal launching of the Center is planned for the spring of 2001, the first year of the new century. We hope readers of this newsletter will want to get in on ground floor as financial patrons, as project proposal initiators, and in other creative ways. Its goal is to repair and preserve humankind’s heritage as found in treasures across the world, irrespective of nationality or religious affiliation. He has now taken on the responsibility on our behalf of raising a special fund dedicated to the repair and restoration of cultural art treasures in the imperial convents, the condition of which is sorely threatened and which the convents themselves cannot afford to repair. The first corporate donor to join us has been Sagawa Kyûbin, Inc., with a pledge of close to $30,000 a year. Since overall cost will be at least ten times that much yearly, we are eagerly seeking other donors, both individual and corporate, who would like to join Hirayama Ikuo and indeed Empress Michiko in this effort to preserve one of Japan’s most important cultural heritages, unique in the world. The staff of the Institute for Medieval Japanese Studies extends our warmest congratulations to our Director, Professor Emerita Barbara Ruch, for being named 1999 recipient of the Yamagata Bantô Prize. Established in 1982 by the distinguished Japanese novelist Shiba Ryôtarô, the prize is administered by the Osaka Prefectural Government Department of Civic and Cultural Affairs. It is awarded annually to one Japan specialist from Asia, Europe, or America, nominated by experts in various fields at Japanese research institutes, universities, and international cultural exchange organizations around the world. The Yamagata Bantô Prize is named for the eighteenth-century merchant-scholar Yamagata Yoshihide, a major financier who contributed to the economic reconstruction of late feudal Japan and who wrote prolifically on a wide range of subjects including Confucianism, Astronomy, and Western sciences under the pen name Bantô. In keeping with Bantô’s legacy, Professor Ruch was selected “as one of the leading Japanese cultural researchers of the world, including Japan, to honor her outstanding creativity, vitality, and achievements.” At the award ceremony held this March in Osaka, Professor Ruch gave a commemorative lecture, speaking about the thirteenth-century female Zen master Mugai Nyodai, an important but little-known figure who captured Professor Ruch’s scholarly attention and led to the Institute’s current projects on the previously neglected topic of women’s role in Buddhist institutional history. Professor Ruch has donated the three million yen prize award to the new Institute for Medieval Japanese Studies Kyoto Branch to further scholarly work on Women and Buddhism. On March 7, 2000, the Institute hosted the annual visit of Fukushima Keido, Chief Abbot of Tôfukuji monastery in Kyoto. Chief Abbot Fukushima presented a series of programs including an offering of sutras to Abbess Mugai Nyodai, a lecture entitled “Chinese Zen Master Jôshu’s Zen,” a Zen calligraphy demonstration and finally, a zazen meditation session for all levels. Chief Abbot Fukushima supervises more than 300 temples in the Tôfukuji sect of Rinzai Zen Buddhism, a religion that dates back to the thirteenth-century Japan. He has been a major supporter and advisor to the Institute’s research work in Japan. On January 29, 2000, the Institute presented a workshop on early Japanese books, led by Suzuki Jun, Professor of the National Institute of Japanese Literature in Tokyo. The event, which was co-sponsored by the Donald Keene Center of Japanese Culture and C.V. Starr East Asian library, provided a select group of New York-vicinity scholars and graduate students with hands-on knowledge of Edo-period books, including information about their historical significance, binding and formatting, and publishing practices of the day. All the materials used came from the Japanese rare book collection of the C.V. Starr East Asian Library and were selected by Ms. Mihoko Miki, Japanese Studies Librarian. In June, the Institute was honored to present “Meditations at Sunset: Drawn to the Evening Sun of Amida’s Western Paradise,” an exhibit of photographs by Abbess Fushimi Seikan of Tokujô Myôin Convent, Kyoto. The Abbess came to New York for the duration of the exhibit, which was held from June 12th-June 23rd in the Rotunda Gallery of Low Memorial Library at Columbia University. Abbess Fushimi was born on December 1, 1938 in Tokyo, Japan. She is the great-granddaughter of Japan’s last shogun, Tokugawa Yoshinobu, the granddaughter of Prince Fushimi Hiroyasu, and the daughter of Count Hirohide and Countess Toyoko Fushimi. She entered Tokujô Myôin convent at the age of nine in 1948 and took the tonsure five years later. She graduated form Bukkyô University, a Pure Land denominational school, in 1962. In addition to being an amateur photographer of high acclaim, Abbess Fushimi is also an accomplished poet, calligrapher, and iemoto master of the Keihô Schools of Tea Ceremony and Flower Arrangement. On June 12th, the public was invited to celebrate the opening of the exhibit with a program of events featuring a talk by the Abbess and demonstrations of the tea ceremony and flower arrangement. We are grateful to the Japan Foundation, the Toshiba Foundation, and the Tides Foundation for making this event possible. On September 5, 2000, Japanese taiko drums heralded the first day of classes at a noontime concert held on Columbia’s Low Memorial Library steps. The Institute proudly sponsored this free concert by the Shumei Taiko Drum Ensemble, belonging to the Shinji Shumaikai of Japan, a world-renowned troupe that visiting New York City to perform at the first World Peace Summit held at the United Nations. The powerful drumming drew a crowd of more than 800 people. The Donald Keene Center for Japanese Culture co-sponsored the event. On October 17, 2000, the Institute presented an evening of Satsuma biwa music and narrative songs by Fumon Yoshinori, the foremost living exponent of the oldest style of the Satsuma biwa tradition extant today. 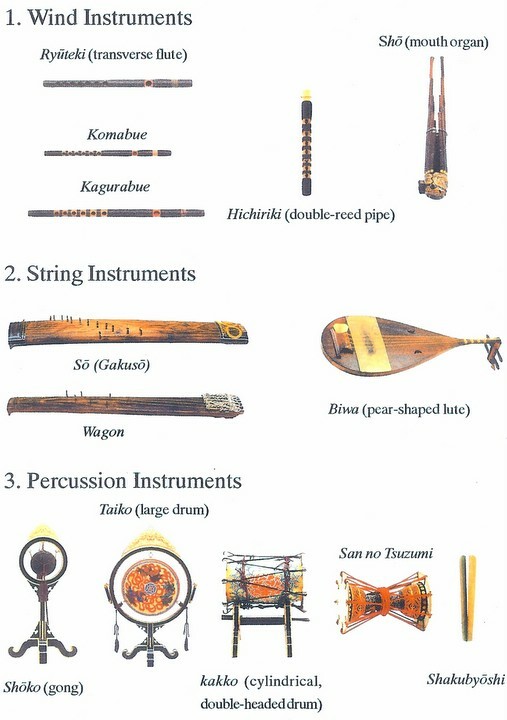 Before the concert, Hugh de Ferranti, a traditional Japanese music specialist at the University of Michigan, spoke about the Satsuma biwa instrument, a type of long-necked lute, and the song style that originated in southern Kyushu in the former Satsuma domain. 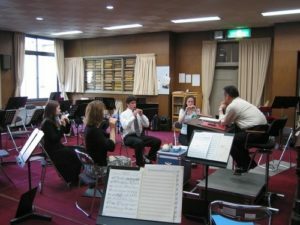 In between songs, Fumon-sensei’s student Thomas Charles Marshall gave a demonstration of the instrument and took questions from the audience. The event, which drew a standing-room-only crowd, was co-sponsored by the Donald Keene Center of Japanese Culture. The Institute was honored to host the eminent Fumon-sensei, who at age 89 was making his first visit to the United States. In a continuation of the Institute’s on-going efforts to encourage the globalization of Japanese music, the Institute welcomed Miyata Mayumi, Japan’s foremost contemporary performer on the ancient gagaku wind instrument, shô, for a concert at Columbia on November 10, 2000. Ms. Miyata performed the night before at Carnegie Hall at an event held in conjunction with Music From Japan’s 25th anniversary. Our event included a keynote speech by John Rockwell, editor of the Arts and Leisure section of The New York Times; a demonstration of shô music; and a panel discussion moderated by Sharon Ann Nakazoto with Mr. Rockwell, Ms. Miyata, and the composers Toshio Hosokawa, Karen Tanaka, and Lois V Vierk. The event was co-sponsored by the Donald Keene Center for Japanese Culture and by Music From Japan. As part of the Institute’s efforts to encourage the globalization of traditional Japanese musical instruments, on February 15, 2000, the Institute hosted the Tsugaru shamisen player Takahashi Chikuzan II. 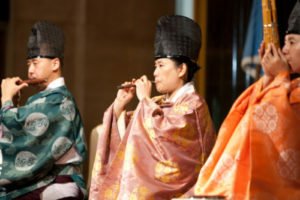 Chikuzan II brought her distinctive musical gifts to a packed performance in Dodge Hall, sponsored jointly by the Institute, the Donald Keene Center of Japanese Culture, and the New York-based Music From Japan. Takahashi started studying the shamisen at age eleven, and at age eighteen she began an apprenticeship with shamisen master Takahashi Chikuzan I, whose name she took in 1997. 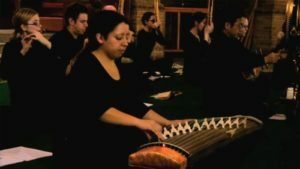 The “Tsugaru” type of shamisen originated in the Aomori region of northern Japan, and Chikuzan’s repertoire includes many Tsugaru folk songs, as well as more contemporary pieces of her own creation. Her mesmerizing performance was prefaced by a lecture on traditional Japanese music by the distinguished musicologist Professor Kojima Tomiko. On November 16th, 1999, the Institute for Medieval Japanese Studies was honored to present a lecture and discussion by the distinguished Buddhist nun and author Setouchi Jakucho. To a tightly-packed audience on the Columbia campus, Reverend Setouchi spoke on the topic of “Josei no shukke to Genji monogatari” (“The Tale of Genji and Women Entering the Religious Life”). She wove together her own experience of becoming a nun with her interpretation of sections of The Tale of Genji, in which women characters take the tonsure. Seventy-eight-year-old Setouchi Jakucho, who in her younger years wrote under her secular name of Setouchi Harumi, is still a prolific author of many short stories, novels, and essays. She recently translated The Tale of Genji from classical Japanese into the modern Japanese language, and her skilled translation became a bestseller, rendering this famous work accessible to a large readership. Earlier this year, Reverend Setouchi’s generous support enabled the Institute to open our Kyoto branch office. We remain deeply grateful to her and look forward to welcoming her back to the Institute soon. On February 18, 2000, Professor Karen Smyers of Wesleyan University delivered the Institute’s First Distinguished Lecture on Shinto and Culture. Her talk, entitled “Shinto and Shamanism: Multiple Interpretative Worlds at the Fushimi Inari Shrine,” illustrated with slides, centered on the shamanic component of the Fushimi Inari Shrine in Kyoto, which is the subject of her newly published book The Fox and the Jewel: Shared and Private Meanings in Contemporary Japanese Inari Worship (University of Hawaii Press, 1999). Days of Discipline and Grace: Treasures from the Imperial Buddhist Convents of Kyoto is 44-page bilingual full-color exhibition catalog containing photographs of calligraphy, ritual objects, portraits of abbesses and furnishings related to the daily lives of Imperial Japanese Buddhist nuns. Organized by the Institute at Columbia University in November and December 1998, it was the first time these treasures had ever been exhibited in public. Each copy costs $10 plus shipping and handling. To order copies, please write or call the Institute. The Institute’s activities are entirely dependent upon external funding through donations, grants and gifts. We need your financial support. Please form a kechien link with us by considering the Institute when you are making your financial donations or planning your estate. You can also help us in the short term by donating art or property, the sale of which will provide needed support for the extremely costly task of preserving and photographing religious and cultural treasures from the Imperial convents that belong to the world for posterity. The Institute for Medieval Japanese Studies, founded in 1968 at the University of Pennsylvania and since 1984 located at Columbia University, is an international research and liaison center designed to serve all scholars, regardless of nationality, whose main area of study focuses on pre-modern Japan. The overall purpose of the Institute is to encourage both individual and collaborative research on all aspects of Japanese civilization relative to the medieval period, centuries which, until the 1970s, had been relatively neglected among Japanese and Western scholars alike. The facilities of the Institute are available to all scholars and students of medieval Japan from any academic institution. The logo of the Institute for Medieval Japanese Studies is the monogram (kaô) of Ashikaga Yoshimitsu (1305-1358), which was selected for the Institute in the year of its founding by the late Professor Atsuyoshi Sakakura of Kyoto University.